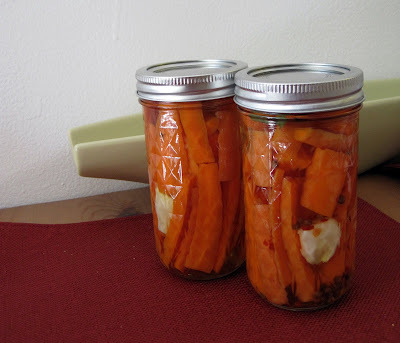 Yes, carrot pickles. After living in Japan and eating pickled veggies with practically every meal, I've recently started to miss it. Good thing I've been in a canning phase, because I've found sound pretty awesome pickled veggie recipes. Today I tried my hand at some pickled carrots. I was inspired by Marisa's (Food In Jars) pickled carrots and went from there. I used a blend of coriander, pepper flakes, garlic, chinese star anise, and crushed bay leaves for my spice blend for the brine. I'm anxious to dig in...but I have to wait until they are fully pickled! I'm planning on keeping these in the refrigerator, so I didn't process them to make them shelf-safe. If they turn out well, I'd love to make a larger batch...maybe even use baby carrots? Wouldn't those be cute? I love mini things. Just a little update of my progress from my latest cross stitch project. It's coming along, slowly but surely. In other news, I'm co-hosting a craft club this week which I'm super stoked about! What's better than some fun girls getting together to craft?! 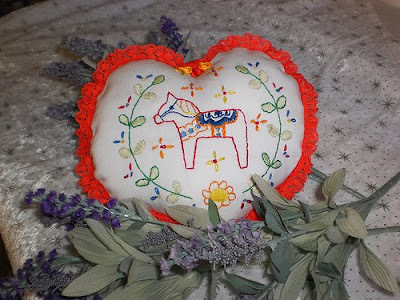 Christina (Golden Lilly Crafts) made this adorable Dala Lavender Heart Pillow. Muriel (Hopfaldera) created this cutesy Dala pouch. 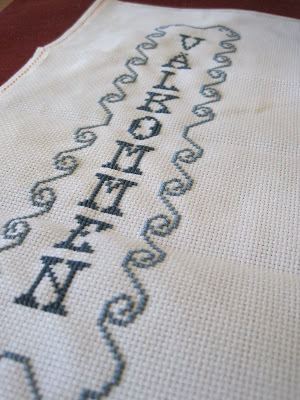 I love the stitching on this, so, so, so cute! Meg (Megacrafty) made this amazing and intricate polymer clay ornament! Thank you all so much for joining in the Dala crafting fun! It was such a blast seeing what everyone made and how many different Dala projects were made! 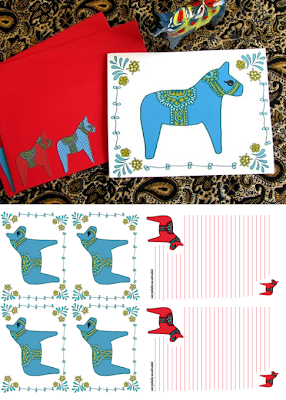 Just because the Craftalong is over doesn't mean you can't still make something Dala-themed. Feel free to keep adding any additional photos and projects to the Flickr group here. Hi everyone! Today I'm guest posting over at Astrid's blog, Red Red, come say hi! 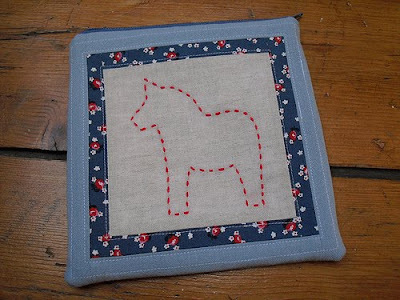 I'm sharing a tutorial on how to make an inverted-appliqued Dala Horse hot pad! And today's the last day of the Craftalong, I'll be doing a round-up later today. 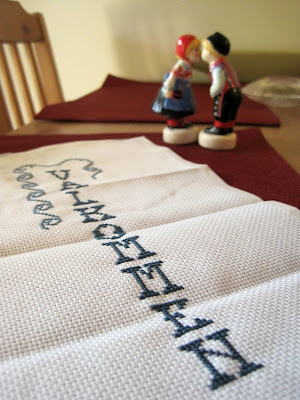 A while back I was looking for some fun cross stitch patterns but couldn't find any. And then I went through my mom's linen closet. Lo and behold, cross stitch kit gold! She had this super cute pattern for a Swedish bell pull that says "Welcome" in Swedish. It's been my go-to project these days when I have a few minutes and want to do something crafty. In other news, I'm looking forward to Fall and Winter so I can pick up my knitting again. I know I can pick it up now, but just don't have quite the same motivation as when it's cold out. Jam. I’m currently in a jamming/canning phase. 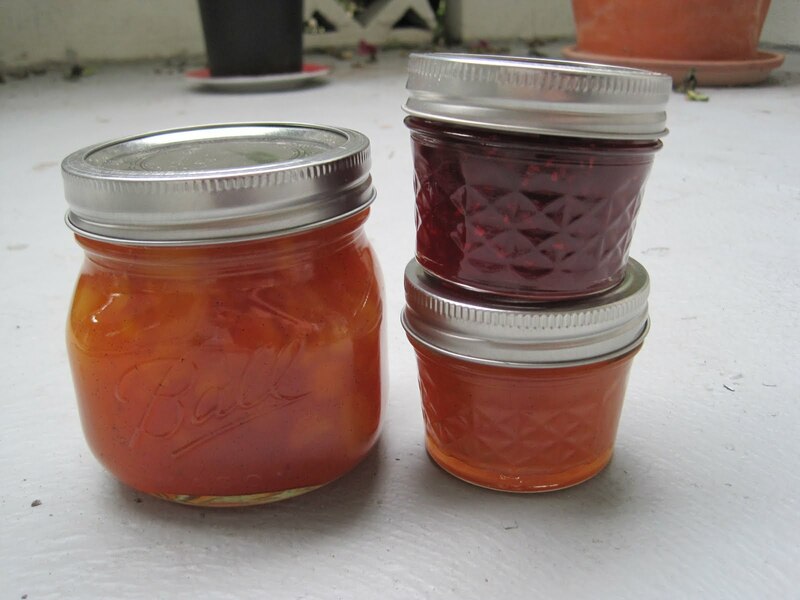 I’ve only made two batches so far, but I dream about all sorts of things to jam and can. If only I had an unlimited supply of canning jars and fresh produce…and time, too, I guess. 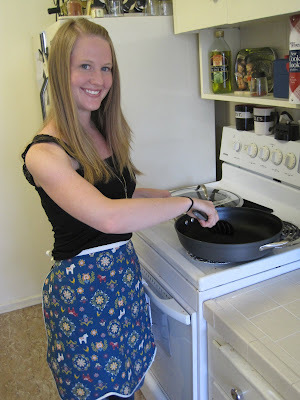 My love of canning goes all the way back to two weeks ago; when I stumbled across this blog. It makes you want to can pretty much everything you see. My love for jam, however, goes back a bit farther. Back in college, my bestie and I spent a summer in northern Michigan. We were ice cream-scoopers by day, jammers by night. We had a freakishly strong right arm (because of all the scooping) which only helped us in our jamming ventures. We even created our own jamming company - We Be Jammin’. Although, it should be said that we gave away more jam than actually selling…but, hey, we had fun. We picked our own strawberries and blueberries and made delicious jams and preserves. Needless to say, it was a grand summer. My first batch of jam this season was raspberry jam. I found these cute little jars – 4 oz. quilted Ball jars – and got to jamming. Then a couple days ago I made peach vanilla-bean jam. I’ve never used a real vanilla bean before, it was fun! I love seeing all the flecks of vanilla throughout the jam. 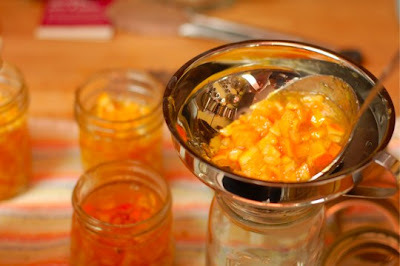 I'm dying to try this Orange-Ginger Marmalade...yum. And then I want to attempt homemade pickles. Anyone know of a good recipe for either dill or bread and butter pickles? Pam (Gingerbread Snowflakes) made matching Dala aprons for her and her daughter using Carina's fabric - don't you love the green trim?! 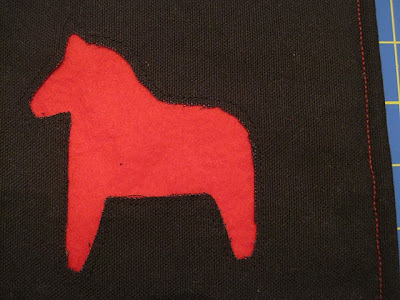 Perhaps the smallest of the Dala projects so far, Dunderklumpen12 created these mini felt Dala brooches. Jani (the Butterfly Jungle) embroidered this cutie of a Dala right onto an apron. Christina (Golden Lilly Crafts) made these adorable Dala babies! What I love most is that she gave them each a different name. From left to right: Thor, Inga, Brother Bo, and Laila. 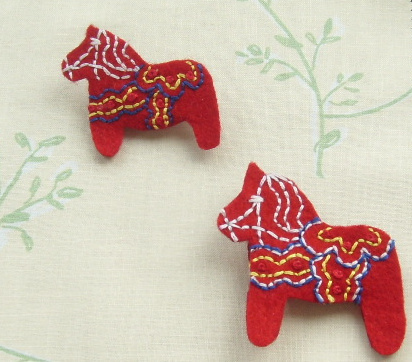 She even has a great tutorial showing how to make your own Dala softie (pattern included!). It's not too late, you can still join in! The Dala Craftalong continues until August 21. 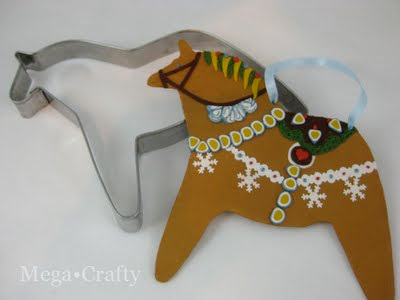 But don't worry, there are no rules against Dala crafting after the 21st, it's even encouraged. Upload any of your new Dala crafts to the Dala Craftalong Flickr group here. I finally finished the tutorial I promised last week. It is seriously easy. The hardest part of this tutorial was trying to get the pattern figured out. Tricky stuff for a girl like me. But with the help of the friendly blogging world and deciding to just upload it to flickr, I finally figured it out! So without further adieu, here it is! First, print out the linked pattern, assemble and cut. Pin the pattern and cut out your fabric. 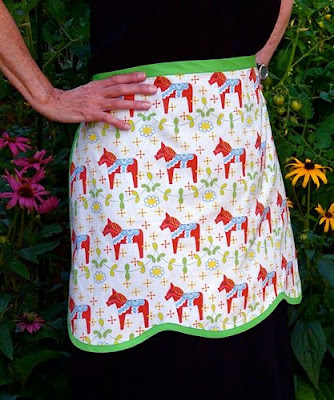 Next, pin your 1/4" bias tape around the bottom and sides of the apron. 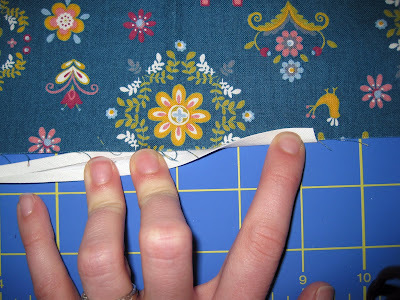 You don't need to cut an exact amount of the bias tape. Just pin around and trim off any excess. Then, sew. Carefully. I'm usually a cheater when it comes to pinning things, but this part is actually crucial that you pin and sew it well. Take your time. You can use the 1/2" bias tape for this part too if you think it'll be easier. Make sure when you're sewing that you're catching the three layers: front of the bias, fabric, back of the bias. The fabric easily slips out if you don't pin it well. Lastly, [yes, it's this fast!] 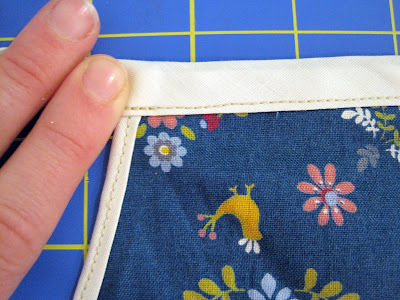 pin your 1/2" bias tape centered on your apron and across the top. Sew, sew, sew! Start at one end of the bias tape and sew shut along the entire edge, catching the apron section on your way to the other end. 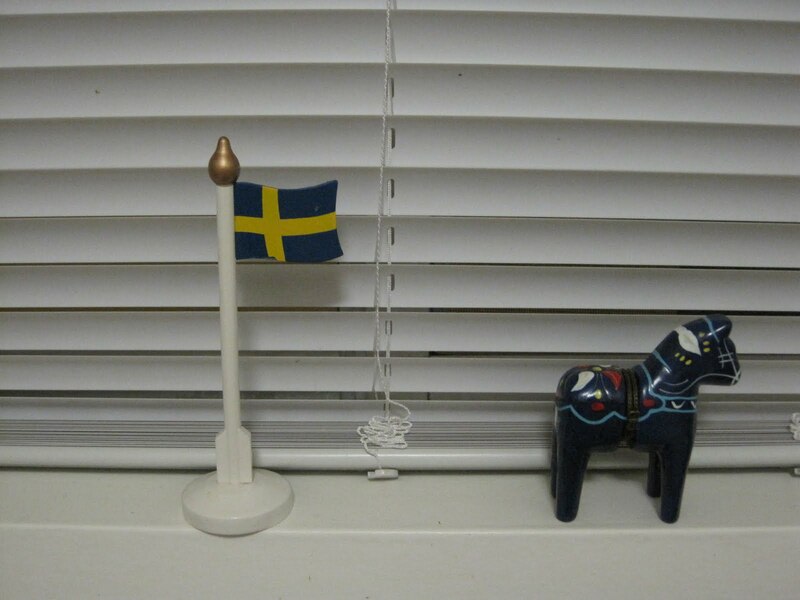 Bake something Swedish. Think about Dalas. Enjoy. 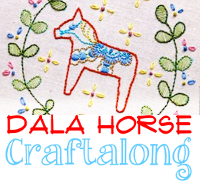 And if you haven't yet, join in the Dala Craftalong! 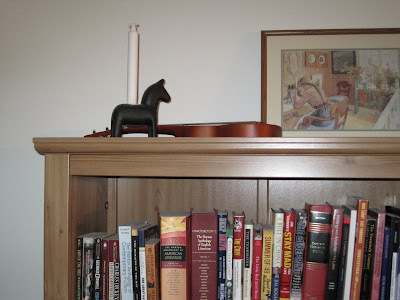 Just wanted to share a little Dala decor around my sister's house that is inspiring for the craftalong month. The apron tutorial is still in the works. Check back Saturday for the free pattern and tutorial!